Did you know that a whole house generator is different from a portable generator? Apparently, most people use these two terms to refer to the same thing. However, a whole house generator is bigger in both size and power, while a portable generator only acts as a backup power source for the most important electronics in your home. In the article below, we shall help you discover the best whole house generator for your needs with the following whole house generator reviews. But before then, understand that whole house generators have power ranging from 5-50 kilowatts, which is, in turn, enough power to handle all the electronic devices and lighting needs any average home requires. And as you read the following reviews also, be keen to note the slight differences found in every generator, so that in the end you can buy the best generator that will offer the best value for your money. 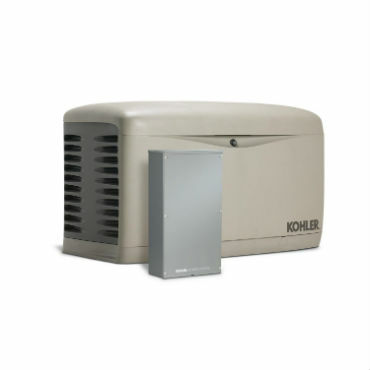 The Kohler 20RESCL-200SELS 20 kW generator is a powerful and reliable machine that is common in homes, hospital and hotels. To homes especially, the 20 kW provided by this machine is enough to keep your family warm and your electronics running all night long. Read the features below however to understand more why this machine could be your perfect companion during power outages. Corrosion proof Construction – The Kohler model is big and strong, and particularly strong enough to resist any kind of corrosion. This makes the 500 pounds weighing machine a great generator for any part of the country, as it could withstand even powerful storms. It is not so big however, as it measures 48*26.2*29 inches. Fast Response – The Machine powers up in as fast as 10 seconds to ensure your home stays lighted and warm during the harshest of weather conditions. Powerful – With its ability to provide 20 Kilowatts of power, the Kohler model can handle almost any type of electronic device an average home will have. It is also connected to handle the maximum, 200 Amperes most American homes are set to accommodate. Again, the machine’s power is safe enough to handle sophisticated electronics from damage. Quiet Operation – The generator operates quietly, even when handling your central air system or other big electronics in your home. To be specific, the machine produces noise levels similar to a normal central air system. Reliable Engine – This generator comes fitted with one of the most powerful Kohler engines for a powerful and reliable performance. The engine with its hydraulic valve lifters runs quietly while also maintaining an air cool performance. Designed for Easy Installation – It features a load connection terminal for easy field wiring, a hinge locking roof and a Polymer base so that you don’t have to look for a concrete mounting pad. 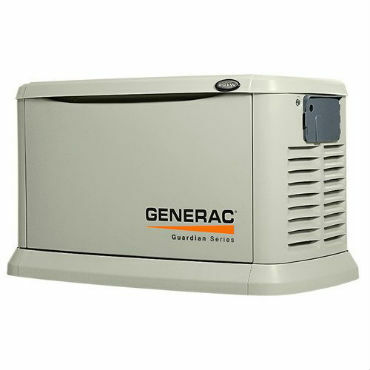 The Generac 6462 Guardian series is a 16 Kilowatt generator that runs on both liquid propane and natural gas. The generator has in multiple occasions been ranked highly despite producing less wattage than other whole house generators. All the same, its16Kolwatts worth of power is enough to light your house and power all other electronics during emergencies. Here are its other features. Dual Fuel Machine – The Generac 6462 Guardian series machine gives you the option to use either natural gas or liquid propane as alternative fuel sources. But despite the power source you choose, this generator runs smoothly and will handle even sensitive electronics. True Power Technology – The generator runs on a special true power technology which ensures you not only get enough power for your electronics, but you also get safe and reliable power. Again, the machine comes with a 200-Amp service automatic switch which when connected to this generator will enable your whole house to stay warm, lighted and with electronics powered as normal. 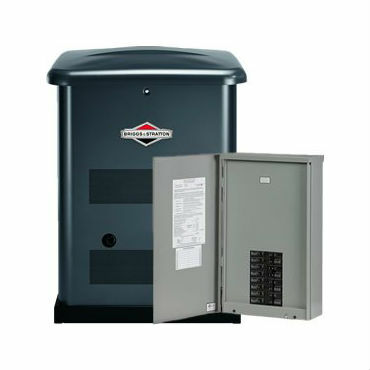 Easy Installation – Despite its large size, you can install the Generac Guardian generator in a matter of a few hours. And to support this, the generator comes with a pre-wired transfer switch, re-engineered connection points and a mounting pad so that you don’t have to install a concrete base of your own. Durable Corrosion Resistant construction – The generator’s powder coat finish makes it strong enough to withstand even the harshest of weather conditions. Again, the machine’s construction is meant to withstand winds as strong as 150 mph. Quick test run and fast response – Testing this generator is fast and quiet, as you could do the exercise for twelve minutes every once in a while without experiencing any glitches at all. On the other hand, the generator’s response time is swift enough to bring back your lights on in less than fifteen seconds. 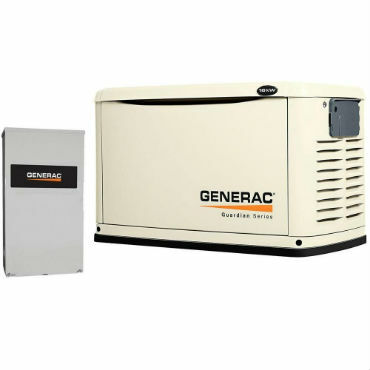 The Generac 6237 Guardian series model is one of a few top whole house generators that operate quietly on a hands free operation. By this, you could rely on the machine for all your power needs without having to get involved in its operation. 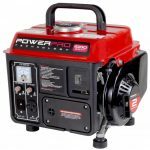 On the other hand, the generator is powerful and reliable, and if the following reviews are anything to go by, this is a machine anyone in need of a generator should consider buying. True Power Technology – Along with its 8 Kilowatts worth of power, the Generac model features a safe technology that guarantees less than 5% of harmonic distortion. This safe power is, in turn, great on all kinds of electronics, from the complex central air system to the sensitive cell phone devices and laptops. Dual fuel – The generator runs on natural gas or liquid propane, and sits outside so that your house stays safe from any eventualities. All the same, the ability to use either fuel sources could be of convenience to everyone, because on one hand natural as is readily available while propane is clean and more suitable for sensitive electronics as well. Circuit power protection – The 8 kW machine comes with a circuit protection feature that ensures your home’s lights and refrigerators remain on soon after your normal power is gets disrupted. Easy to Install – The generator comes fitted with re-engineered connection points, a mounting pad, and a pre-wired transfer switch to help you install in the quickest time possible. It is a bit heavy, though, and measures 48*25*29 inches, meaning you may need to call professionals to do the installation work for you. Quick test and response time – The generator’s test run could be as quick as ten minutes because it doesn’t, after all, require any manual startup or fueling. On the other hand, the machine is digital set to power on as soon as normal power supply gets disrupted. 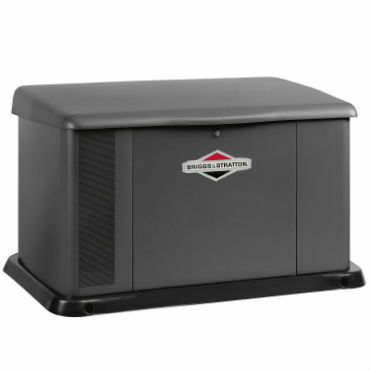 The Briggs & Stratton whole generator protects your home with reliable power supply when you need it the most. On the other hand, this particular model is a bit smaller and lighter than previous versions of the 40532, plus is a bit cheaper too. When it comes to power, however, the machine proves to be a great investment in any home. Read below to get its full features all the same. Powerful Construction – The new Briggs & Stratton 40532 is small but durable as it comes fitted with a galvanized steel body. It is also painted with powder-coat paint to give it a life free of any corrosion. 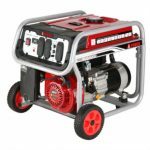 Reliable Engine – The generator supplies 12 Kilowatts of power, which is, in turn, enough power to run most of your electronic devices and keep your house warm whenever there is a power disruption. And to save your energy costs even more, the machine comes fitted with a 4-ton air conditioner that helps the 12 kW machine perform like a 20KW generator. Easy Installation – The generator comes fitted accordingly so that your installation work takes the shortest time possible. It comes with a mounted pad for instance, plus it is certified for installation 18 inches near your house. It also comes with a NEMA 3R rated automatic switch transfer switch to further ease your installation work. Fast Response time – This generator is engineered to power up in the shortest time possible irrespective of how cold the external temperatures are. It comes fitted with a thermostatically controlled battery and oil heaters that enable this fast response time even when external temperatures are not conducive. 100 Amp Circuit Switch – The generator comes with a 100A transfer switch which enables the generator to power your most important electronics and keep your house warm for the longest time possible. 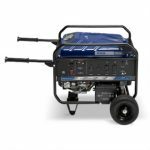 Dual fuel – The generator runs on both propane and natural gas. 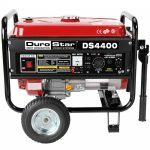 The Briggs & Stratton 40346 20kW is a powerful and reliable generator that would come in handy for any home that experiences frequent power outages. 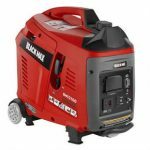 The generator has one of the fastest response times on the other hand, plus it is also one of the smallest whole house generators in the market today. Read below however to get a clear picture of why this generator could be a worthwhile investment in your home. Symphony II Power Management System – With this unique technology, the generator is able to manage all your house power systems and provide enough power until normal power is restored. The technology is also able to handle two air conditioners in addition to the normal appliances at your home. It supports 20 Kilowatts worth of power after all, which is ideally enough power for any average home. Fast Response Time – The generator automatically powers your home’s electronics seconds after your home’s normal power supply gets disrupted. On the other hand, the generator also supports one of the quickest test runs, so that you can always be sure the machine will be functional all year round. Easy to Install – The generator is tested against NFPA standards so that you can install as close to your homes as 18 inches. On the other hand, it comes fitted with such attachments as a mounting pad and a pre-wired switch for easy installation. The generator also comes with a flexible indoor or outdoor weather resistant switch to further ease your installation work. The generator is supported by a four year warranty. Strong and Durable Construction – Measuring 48*34*31 inches, the Brigg & Stratton model features a strong body meant to withstand strong winds and salty ocean environments. The generator is also rated for operation in areas that have low natural gas pressures, plus it can operate at 3.5 to 7” water columns. There is nothing as regrettable as buying an important home use machine in a haste. In the case of whole house generators, for instance, you will probably buy an overpriced generator, or buy a generator that won’t serve you accordingly. To avoid such a scenario, therefore, it is important to understand the basics of whole house generators, so that you will, in turn, be prepared to pick the most ideal machine to serve you during power outages. What matters the most during an outage? Before paying for a generator, list all the electronics or house needs that matters to your family the most. If it is your refrigerator, for instance, list it down together with the wattage it requires to stay on. Once you have a conclusive list of all the things you need a generator for, you can then start thinking of the overall generator’s wattage you might need. However, note that there are certain generators that falter with every increase in power needs, which is why reliability should come to your mind next. Having a generator you can rely on for all your home’s power needs is important, but then, how do you know what generator will be reliable? Usually, most generators that can supply 8 kilowatts or more could handle the 200Amp most American homes need for power. On the other hand, other aspects of the generator such as its construction and response time are equally important factors. This means therefore that while you look for a reliable machine; check the power, the response time as well as a construction that could withstand tough weather conditions when you need it most. A good modern generator should have certain features like an electric start or an alternate fuel capacity. In fact, most whole house generators are convenient enough not to require a start-up mechanism of any kind. The best rated whole house generator, for instance, most probably operates on a hands free mechanism. It also features attachments like a pre-wired transfer switch to make your installation work easy. Looking closely at such features is what help you end with the best machine for your budget. Finally, the best generators should be safe for all your electronics. It should also be safe to be installed near your house, although this should probably be done by a certified professional. All in all, the end goal while look for a good whole house generator should be to find a machine that will serve all your needs, last for long and a machine that won’t make you spend hundreds of dollars every year on its maintenance. Unlike a portable generator, whole house generators don’t need to be rolled out from storage, hooked up to a natural gas line or get started with a manual mechanism. On the contrary, whole house generators provide you all the benefits and convenience you probably wish portable generators offered. Below are some of them. Whole house generators provide greater power than most portable generators- The provided power starting from 5 Kilowatts and could go as high as 100 watts. This makes them a far better option during prolonged power outages, or where you need almost every electronic device and light powered. Automatic Controlled systems-Most whole house generators don’t need to be powered normal power gets disrupted. Instead, they power automatically and switch off immediately normal power is restored. They are permanently installed in place around your house where access to fuel supply is most convenient. This also allows you to place the generator in a place where the risk of exhaust fumes affecting your home will be minimal. They are more durable-Compared to the portable models; whole house generators could last for decades. Add that to the fact that they provide more power for longer hours and you will realize why they are such a great investment in any home. Today’s whole house generators are quiet and reliable-Some of the best rated whole house generators operate as quietly as your normal central air conditioner. When looking for the best whole house generator, consider more than just the machine’s wattage level. Most of the modern whole house generators are after all powerful enough to handle your home’s electronics and lighting needs despite their slight differences in wattage levels. Convenience and reliability for instance as you may have seen in the above whole house generator reviews are very important factors. And these factors should also be at the top of your priorities while you plan to buy a generator. Finally, the generator’s value compared to price should further guide you on what machine to select.